More Basenji Information " "
The Basenji is an alert and playful dog. It moves fast and energetic all the time. It is a breed of hunting dog that originates in Africa. It is known for its unique voice and it barks differently from the rest of the dogs. It produces a yodel-like sound that changes its pitch because of the unusual shape of the dogs larynx. This sound is commonly called as baroo. The vocalizations are undulated, producing random sounds not usually akin to normal and modern dogs. Because of this, this dog breed is often referred as a barkless dog. Basenji is also known for its elegant poise and it reveals his mastery for his own affairs. Coming from the breed of hunting dogs, Basenji dogs tend to work independently and manage to meet strangers without fear. Because of this, there is a need for an owner to train a Basenji well. Otherwise, the dog can go out of control. They are athletic and powerful yet very affectionate to the owner and his family. They will be greatly adored because they never get tired of playing, move quickly and always clever. They have a great sense of socialization because they are house dogs even during the early times. They had day to day affairs with people and this is probably the reason why they do not fear strangers. The ideal size of a Basenji ranges from 16 to 17 inches tall at the shoulder and weighs from 22 to 24 pounds. They are long and tall, making them a square breed. They only require minimal grooming because of their short coat. They neither smell like the typical dog odor because their coat is fine. 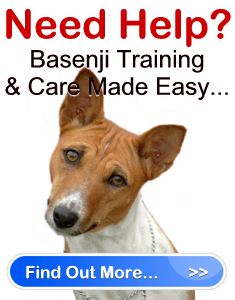 Basenji is a good companion because it forms strong bonds to people especially to owner. Once it develops the trust with the owner, the dog will protect the owner in all instances. It becomes emotionally attached to the owner and its loyalty will stay true to him. Basenji is originally a hunter dog tracing the origin from the early years. They have the ability to adapt to the changing circumstances and presently, they are a great pick for people who want to bring home a playful dog. Basenjis have a medium life span of 13 to 14 years. The common health problem of Basenji is progressive retinal atrophy which usually leads to blindness. They also experience skin problems. This is probably the downside of having short coat. The most typical health problem of a Basenji is kidney failure. This is called Fanconi syndrome. It is a syndrome that occurs when the kidney fails to absorb electrolytes needed by the body. They need regular exercise in order to maintain the physique and elegant poise.